SLOVIANSK, Ukraine – “We had been together for 12 years, but over a year ago, he started battering me,” Anna* described, recalling her husband’s increasingly erratic behaviour. Then a few months ago, he threatened her with a knife and she knew it was time to get away. The following day, she pretended to take her two sons to school, then fled to her sister’s house in another city. But the ordeal left her children reeling, and Anna did not know where to turn. Then she learned about UNFPA’s mobile psychosocial support teams, which provide a wide range of assistance to survivors of gender-based violence. The team helped her move into a shelter. They are now helping her look for a job and permanent housing. UNFPA’s mobile teams have proven to be crucial, aiding women who might otherwise be out of reach, particularly in rural areas. In August of last year, Ukraine’s Cabinet of Ministers announced plans to adopt this model as it rolls out a new nationwide system of services for survivors of gender-based violence. 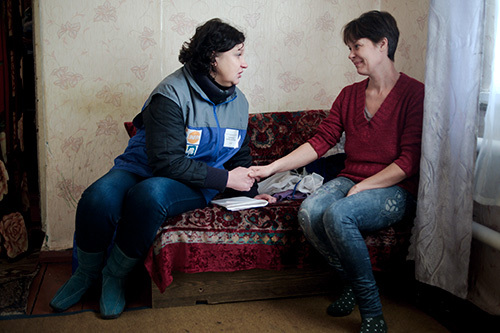 Each of UNFPA’s mobile teams is composed of three specialists – a coordinator, a psychologist and a social worker – who visit families in need, with a focus on those affected by domestic violence. “This was a completely new way for us of working,” said Volodymyr Dziumak, deputy director of the Donetsk Oblast Centre for Social Services for Family, Children and Youth. “The mobile teams can monitor a family’s situation, make repeat visits to their home, bring a survivor of violence to the centre for social services, or hand the case over to other state organizations or lawyers who can provide the needed assistance,” he added. 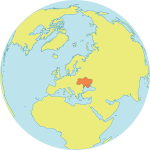 The teams operate in conjunction with the Ministry of Social Policy of Ukraine, with financial support from the United Kingdom. Since the programme was launched in 2015, the teams have handled some 10,000 cases across the country. Now, as the Government establishes its own psychosocial support teams – with technical support and expertise from UNFPA – even more women will receive assistance. Anna blames drug use for her husband’s violent behaviour. While Anna spoke with a psychologist, her sons drew pictures with Alyona, a social worker. The boys are receiving assistance, too. They had begun to show signs of aggression, a common reaction in children who witness or experience domestic violence. Violence has far-reaching effects on both men and women. A recent UNFPA survey in Ukraine found that one in four men had witnessed their mother being physically abused by their father or stepfather. About half had experienced physical punishment from their parents during childhood. Helping families understand and address these dynamics is essential to ending the cycle of violence, she added.